"Ugly" fashion is no longer just a passing trend. Think about it—I bet you can't thumb through your Instagram feed for longer than two scrolls without coming across a pair of chunky "dad" sneakers, loose-fitting baggy jeans, or a bucket hat. Ironic fashion, the kind that purports a, "Yes, I know this is uncool, but I'm wearing it on purpose" look, is here to stay. Quite frankly, we're here for the notion that fashion doesn't have to align with conventional ideas of what's "pretty" or "flattering." This wave of unconventional cool has been on the rise for a few seasons now, but the ugly clothing trends on offer for spring 2019 are no longer niche—they've officially gone mainstream. Tie-dye straight from the '60s. Your mom's acid-wash denim. Smock dresses that resemble loofahs. "Tourist" sandals every bit as clunky as they sound. Surveying runway images for this season and doing some online shopping, it immediately becomes clear that the biggest styles right now are those we probably laughed at just a few short years ago. Everything comes back around again, right? With that in mind, we've rounded up all the spring 2019 clothing trends that once made us run for the hills but now we're jumping at the chance to wear. Keep reading to see why these styles are cool for now and shop each one. Perhaps this is a lesson in biting our tongue whenever we swear off a certain style because we can definitely remember vetoing acid-wash denim from our wardrobes. 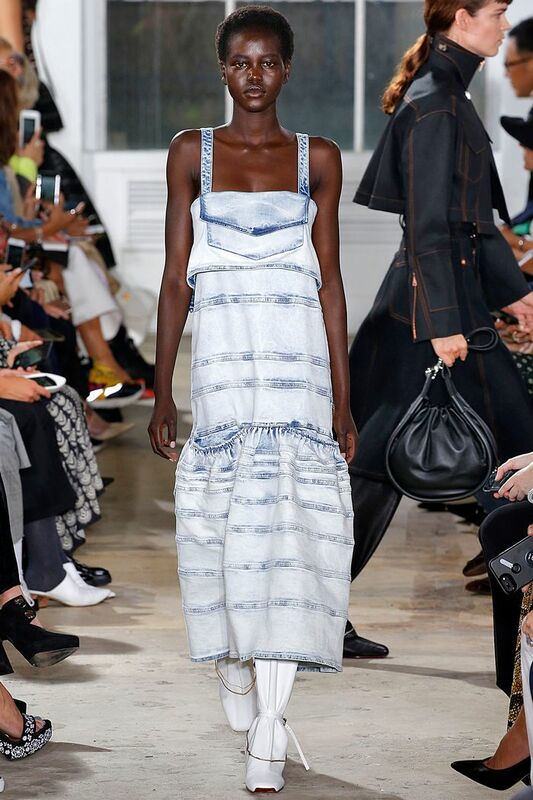 Well, we're going back on our word because the previously hated '80s-era denim trend is emerging all over the place this spring. We have a feeling the fashion set will be wearing it in oversize shapes and accessorizing with crisp white bags and shoes. Ah, tie-dye. For anyone with summer camp memories full of tie-dye DIYs or a pile of hand-me-down tees from your parent's Woodstock days, you may find the trend either nostalgic or terrifying (or both). Fret not, the psychedelic print is taking on a less literal and more washed-out look that we promise can be quite chic. Smock Dress or Shower Loofah? This spring dress trend turns the volume up to full blast. Puffy-sleeved, tiered smock dresses popped up on the runways at Cecilie Bahnsen, Ganni, and other such indie labels. Sure, the silhouette isn't flattering in the traditional sense, but who cares when it looks this cool? Come summer, you'll see these frocks styled with sneakers or chunky sandals. Fashion loves a good controversial shoe trend and seeing as "dad" sneakers have reigned supreme for a while now, it's just as well that the next wave of "ugly" shoes should arrive. Enter "tourist" sandals. The clunky-soled sporty-strapped style may not be for the faint of heart, but it's a look we can ensure will only gain popularity this year. The utility trend as a whole is on the rise, from khaki pants to oversize pockets, canvas belts, and, yes, cargo pants. Whatever your particular feelings are on the oft-uncool pants, the fashion world has decidedly put its official stamp of approval on them and, honestly, we're here for it (we even designed our own pair, scroll down to see them).